The Philippines found itself in an economic crisis in early 1970, in large part the consequence of the profligate spending of government funds by President Marcos in his reelection bid. The government, unable to meet payments on its US$2.3 billion international debt, worked out a US$27.5 million standby credit arrangement with the International Monetary Fund (IMF) that involved renegotiating the country’s external debt and devaluing the Philippine currency to P6.40 to the United States dollar. The government, unwilling and unable to take the necessary steps to deal with economic difficulties on its own, submitted to the external dictates of the IMF. It was a pattern that would be repeated with increasing frequency in the next twenty years. In September 1972, Marcos declared martial law, claiming that the country was faced with revolutions from both the left and the right. He gathered around him a group of businessmen, used presidential decrees and letters of instruction to provide them with monopoly positions within the economy, and began channeling resources to himself and his associates, instituting what came to be called “crony capitalism.” By the time Marcos fled the Philippines in February 1986, monopolization and corruption had severely crippled the economy. In the beginning, this tendency was not so obvious. Marcos’s efforts to create a “New Society” were supported widely by the business community, both Filipino and foreign, by Washington, and, de facto, by the multilateral institutions. Foreign investment was encouraged: an export-processing zone was opened; a range of additional investment incentives was created, and the Philippines projected itself onto the world economy as a country of low wages and industrial peace. The inflow of international capital increased dramatically. In the latter half of the 1970s, heavy borrowing from transnational commercial banks, multilateral organizations, and the United States and other countries masked problems that had begun to appear on the economic horizon with the slowdown of the world economy. By 1976 the Philippines was among the top 100 recipients of loans from the World Bank and was considered a “country of concentration.” Its balance of payments problem was solved and growth facilitated, at least temporarily, but at the cost of having to service an external debt that rose from US$2.3 billion in 1970 to more than US$17.2 billion in 1980. It was in this environment in August 1983 that President Marcos’s foremost critic, former Senator Benigno Aquino, returned from exile and was assassinated. 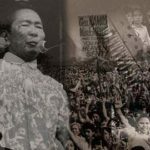 The country was thrown into an economic and political crisis that resulted eventually, in February 1986, in the ending of Marcos’s twenty-one-year rule and his flight from the Philippines. In the meantime, debt repayment had ceased. Real GNP fell more than 11 percent before turning back up in 1986, and real GNP per capita fell 17 percent from its high point in 1981. In 1990 per capita real GNP was still 7 percent below the 1981 level.